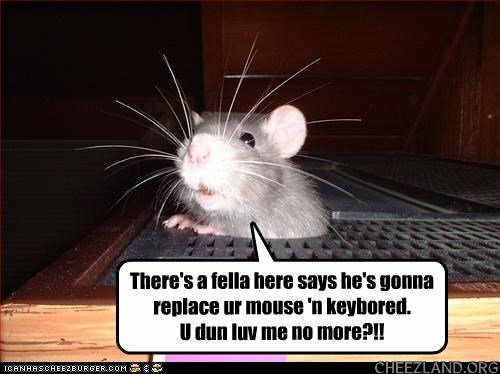 Nawt u, mowsie is teh lektronik wun dat needz riplaest! No, no, is okeh, littlol mowsie – we gibs yu a vakayshun wid lots of snaks an inneresting toies, an we keeps lovin yu wen yu wants to cuddol. Iz otter, plastickly mowse, dear littlol wun. Yoo am part ob fambly — wii nawt nebber replace fambly! Aifinkso pet rattie . Eye mist mai boiz.